keeps an apiary; hives and feeds bees, and removes honey from hive in large or small comb; extracts honey from large comb with machine extractor, a machine resembling a milk separator, which extracts honey by centrifugal force, and draws off honey into bottles through tap at bottom of extractor; returns combs to hive for further use in honey-making; sells honey either extracted or in small comb; may breed bees and queens of special strains; may also give advice to amateur beekeepers or look after bees, e.g., swarming, extraction of honey, on their behalf. visits bee-keeping members of British Beekeeper's Association and gives general technical advice on bees, particularly with regard to disease; may act as judge of honey, bees, and bee-keeping appliances at agricultural and horticultural shows; must have passed the final examination of the British Beekeeper's Association; may also be a beekeeper (q.v.). fattens poultry for market, generally by cramming process; selects and confines birds to pens; mixes food to consistency of cream; fills crops of birds through tube inserted down throat. removes feathers and prepares poultry for market. feeds seeds from a measure into rotary cylinder or drum of seed cleaning machine; fits machine with fine or coarse wire sieve according to class of seeds to be cleaned; operates machine which causes seeds to fall from drum on to sieve, the dirt being blown out by a series of fans. cuts with scythe or sickle and gathers fern, bracken or heather for stable bedding, litter, etc. ; forks into cart; usually done by farm labourer (024) (q.v.). keeps heath and common land clear by cutting furze (gorse) with bill hook and gathers in heaps to burn; usually done by farm labourer or labourer for rural council. looks after geese on common land, and prevents them straying; feeds and waters them and drives them back to the farmyard at night; obsolescent . is responsible for keeping grass plots trim and tidy in certain public streets and squares; mows, weeds, rolls, and sweeps lawns; trims edges; waters lawns from hose in dry seasons; may also maintain gravelled paths in good order. grows small hop plants to sell to hop growers. collects seaweed on seashore, raking it into heaps above high water mark; may gather from water in boats with help of grappling irons and long-handled sickles; when dry, burns heaps to ash for sale to chemical factories for recovery of iodine; work usually done by crofter (011) (q.v.). a labourer on willow or osier bed who does any general labouring work, under direction of osier grower (q.v. ); work sometimes done by osier grower. traps or digs out moles; works on his own account, or contracts to clear land of moles; sometimes regularly employed by Drainage Board or by one farmer or landowner; sells skins. cuts or tears up and collects spagnum [sic ] moss for surgical uses or for use by florists as basis for wreaths, etc. ; stacks to dry; ties up in bales with twine for transport; usually an independent worker, supplying moss under contract. works on a "moss," or piece of reclaimed land, as agricultural worker or land drainer. 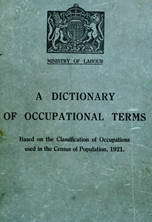 Scottish term, ; contracts with farmers to cut peat fuel and supply moss litter; removes, by spade, top layer of moss or leather which covers peat, and prepares for peat digger (q.v. ); dries moss for sale as litter; may also dry and cut peat. immerses osier, willow, or withy rods in large tank of boiling water for several hours to "buff" them; extracts rods, allows them to cool, peels them and dries them in sun and air; sometimes also does work of osier peeler (q.v.). (ii) supervises work of labourers engaged in various operations of osier growing, including labourer in rod holt, osier boiler, osier peeler (q.v. ), and sells rods to basket makers. stands cut willow rods (see willow cutter) upright in shallow pits of water until sap rises and growth begins; strips or peels bark from rod with brake, a scissors-like tool, with or without previous boiling; work sometimes done by osier boiler or by osier grower (q.v.). digs and cuts peat with special peat cutting spade; lifts out pieces of peat and sets to dry; usually done by crofter (011) (q.v.). cuts moss away from peat bank and spreads to dry; bundles and ties up in bales for sale as litter. assists poultry man (q.v.) in feeding and watering poultry, or in cleaning out houses and utensils and collecting eggs; takes eggs to station; acts as messenger generally. feeds and waters poultry on poultry farm, cleans out houses and lays litter in them; collects eggs, kills fowls, and separates broody hens in pens. supervises work of poultry men and boys (q.v.) for farmer; attends at market or sales of poultry; superintends hatchings and broodings; checks records received from poultry men; buys poultry food; works generally under direction of employer. sets snares or traps for rabbits; sometimes dislodges rabbits from burrows with ferrets; may sometimes shoot; sells as food. exterminates rats by trapping, poisoning, with ferrets and dogs, or by other method. cuts and gathers reeds with scythe and sickle, for use in thatching or as litter; stacks reeds to dry; generally works on own account; sometimes an employed person; cf. river weed cutter. cleans silt, weeds, and rushes with spade and rake from reens, i.e., shallow waterways acting as boundaries between parishes in Somerset and South Wales; repairs banks; also cleans and repairs tributory [sic] ditches; cf. drainage labourer (026) (q.v.). undertakes contract to clear certain parts of a river of any weeds, etc. ; drags net through the water from the banks of the river, or cuts weeds by hand with scythe, from bank; may use a punt and drag or cut weeds as he proceeds. feeds swans and other birds. e.g., ducks, water hens, kept in public parks; provides cover from inclement weather, especially during breeding time; feeds birds and cleans out huts or sheds; may be done by park labourer (970) (q.v.). roughly sorts teazles into sizes after drying (cf. teazle grower (011)) and ties them in gleanings, i.e., bundles of twenty-five; fixes twenty gleanings horizontally into a split rod, or stave, and ties rod together at top, ready for sale to teazle merchant (770) (q.v. ); works under direction of teazle grower (011) (q.v.). cuts turves under direction of turf dealer (q.v.) using a racer, i.e. a special long-handled knife; cuts pieces of turf 12 inches wide and about 36 inches long, outlining to depth of 2 inches; cuts underneath with a slicer tool; lifts and rolls turf and stacks in heaps for despatch. undertakes contracts to supply turf for tennis lawns, bowling greens, etc., and supervises turf cutters (q.v. ); sometimes also does work of turf cutter. breeds rabbits in a warren; feeds them in winter; snares or traps rabbits periodically for sale; prevents trespass or damage to warren. grows watercress in slowly running water with gravel bed; superintends work of watercress labourers, and watercress cutters (q.v. ); despatches or conveys bunches of gathered watercress to market or sells to itinerant dealers. a watercress labourer (q.v.) who cuts or gathers watercress by band, using a knife, from a watercress bed; also ties up watercress with osiers or bass and packs bunches in baskets or hampers ready for sale or despatch to market. general term for any worker who cleans watercress beds, removes weeds and rubbish, sees that water (running stream) is kept clear, regulates supply of water by building dams of gravel, etc., prepares beds (gravel) for watercress growing and sometimes cuts and bunches watercress ready for market; cf. watercress cutter. a labourer in rod holt (q.v.) who cuts willow or osier rods with hand knife, in October, when leaf falls; usually also trims, or peels them. hoes and digs willow land, and plants setts for osier growth; cf. osier grower.